Trademark is a symbol, mark, or a depiction, which marks the name of any brand and makes it unique from the rest of the market. A legally strong trademark offers a huge advantage to the sale of products or services of a company. Trademark creates brand popularity among the consumers and therefore, it is worth to devote some extra time for its creation. Let’s take a closer look at the three-step process (Figure 1.1) of creating a legally strong trademark. 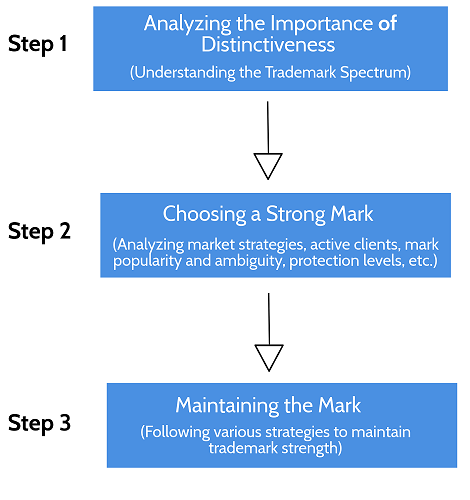 Let’s first understand the Trademark Spectrum (Figure 1.2) to understand the importance of distinctiveness between marks. There are five categories in which marks can be categorized into, namely Generic, Descriptive, Suggestive, Arbitrary, and Fanciful trademarks, are described below in Figure 1.2. The more your trademark shifts towards the left side, the lower will be its uniqueness, resulting in fewer chances of approval. Generic Trademarks: Terms which are so general in nature that they cannot be used as a Trademark to denote a particular brand. It is simply the name of the product or service itself. Since they are so common, they can’t be reserved to be termed as a trademark. For example, to denote a Jewellery brand, its generic name can be ‘Big Necklaces’. Descriptive Trademarks: As the name suggests, these terms can portray the quality of the product or service offered. Similar to generic terms, these marks are also very common and therefore, they are not that difficult to distinguish products/services from one another. Since they are better than generic terms, they get the approval, but on the contrary, they are considered as the weakest marks to receive approval. Being the weakest, they don’t offer much strong protection. For example: ‘Bed & Breakfast Registry’ for lodging reservations services. Suggestive Trademarks: As its name suggests, these marks suggest the users to think of a relation between the product/service and the term. They don’t directly pinpoint the product but depicts a connection. There is a need for thought to figure out how and where they are actually linked. Sometimes, the term can be a possible outcome or a pre-requisite to the product. Since these are considered more creative and unique marks that don’t, on their own, conjure an association with a product or service, they have a higher likelihood of approval by the USPTO, with broader protections. For example: ‘Sweetarts’ for candies and ‘Amazon’ for the large online retailer. Arbitrary Trademarks: Arbitrary terms are generally not associated with your products or services. Since they are not common and most of the times, rare, it’s hard to find a term that matches with it from the same industry. Due to its limited predictability, it is much more unique than the suggestive ones. For example: ‘Apple’ for the name of a computer company. Fanciful Trademarks: They are the strongest and the rarest to protect the associated products/services. It a term which can nowhere be connected to its associated brand or has no area of connection. A fanciful mark is a brand-new term, completely unique from its product/service. For example, ‘KODAK’ for imaging company). Find out what a beginner should make a note of while trademarking! As discussed in Step 1, uniqueness in the trademark secures the brand/product/service in a better way; therefore, utter care must be taken while choosing the right, secure, and strong trademark. The following section includes some perspectives, which all are a must to be analyzed before choosing, filing, and registering a particular trademark. On the basis of consumer’s perspective: It is important to understand what you want your trademark to communicate in front of your users and why do you think the product will be sold. Start thinking about which category will be the best to bring the actual profit and impact from the customers, from the aforementioned five categories. If you want to give a totally different name to your product/service and believe that it can survive and become popular with the totally new name, then go for Fanciful. On the other hand, if you want to play on the safe side and believe that the name must be somewhere related to the outcome or the product, then go for Suggestive and Descriptive (anyone). On the basis of protection level: It is important to understand which level of protection, your product/service deserves. Sometimes, to complement uniqueness, the applicant agrees for a totally new name, not even bothering about establishing an image in his/her consumer’s mind. In that case, loss occurs on the applicant side, since the consumers are not familiar with what the brand does. On the basis of marketing strategies: Marketing agencies play a crucial role in promoting the brand name of any product. It is due to good marketing agencies, even fanciful trademarks become so popular. Not only the product/service needs to be promising and quality-oriented, but even its trademark needs to get popular among the crowd to make the people aware of the brand. These were all the research fields, which need to be seriously done to know according to which perspective, a trademark can be defined; so that it satisfies the applicant and the market requirements. Another element to be taken seriously is that regardless of how unique your mark is, it must not infringe another’s trademark. This could not only be illegal and costly, but it would create confusion for consumers who may associate your mark with another company. The best way is to start searching on any search engine for your own mark, to make sure that you don’t find any other mark similar to yours. Trademark Infringement is something which you should remain cautious of. Before registering your mark find out how you can successfully avoid a trademark infringement. Always use ‘TM’ mark for trademark or ‘®’ notation for federally registered trademark, after your trademark is allowed. Always use your mark as an adjective, and never as a noun or a verb. Always keep your trademark registration active by renewing it before it expires. Always maintain a routine to perform trademark search for possible violations of your mark, and take affirmative actions (if required). Without trademark search, you might have to pay extra charges, if caught for infringement. Choosing the right mark for your needs is the first step in creating a strong, successful, trustworthy brand. See how it can be done. For more information on trademark search services, pricing module and expert consultation please refer to our service page. This entry was posted in Blog and tagged Arbitrary Trademarks, Descriptive Trademarks, Fanciful Trademarks, Generic Trademarks, Importance of Distinctiveness, mark for trademark, Strong Mark, Suggestive Trademarks, Trademark Search, Trademark Spectrum, USPTO, your trademark. Bookmark the permalink.